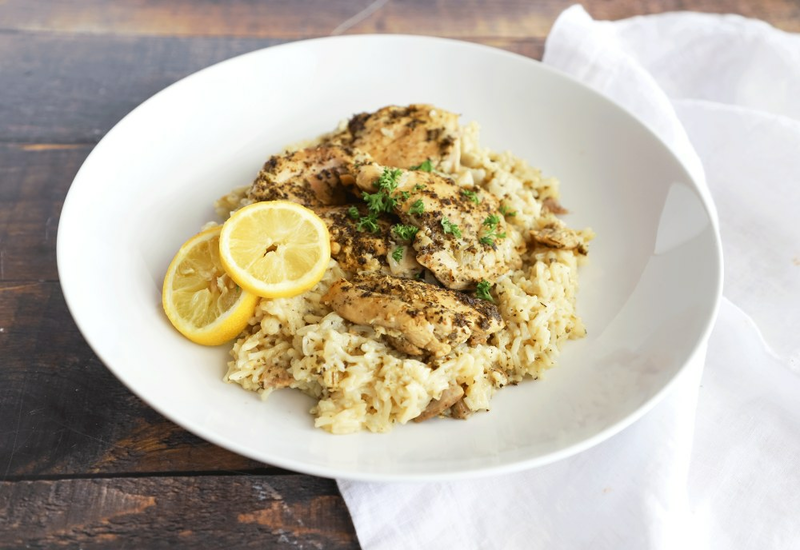 Lemon juice and lemon zest help give a citrus-y boost to chicken and rice in this pressure cooker recipe. Enjoy the brighter flavors of this dish without sacrificing the comfort from its simplicity. You can add vegetables to this and turn it into a full meal in a single pot! Be sure to zest your lemon first. Then lightly roll the lemon on the countertop before juicing the lemon. This will help release more delicious juice for the dish! One benefit of the pressure cooker is the ability to get great flavor from a shorter marination. Cooking the chicken in the marinade provides a stronger, brighter flavor than you might otherwise get with only ten minutes. Per Serving: 405 calories; 16g fat; 35.2g carbohydrates; 39g protein; 173mg cholesterol; 965mg sodium. Definitely one of my favorite recipes on the site. 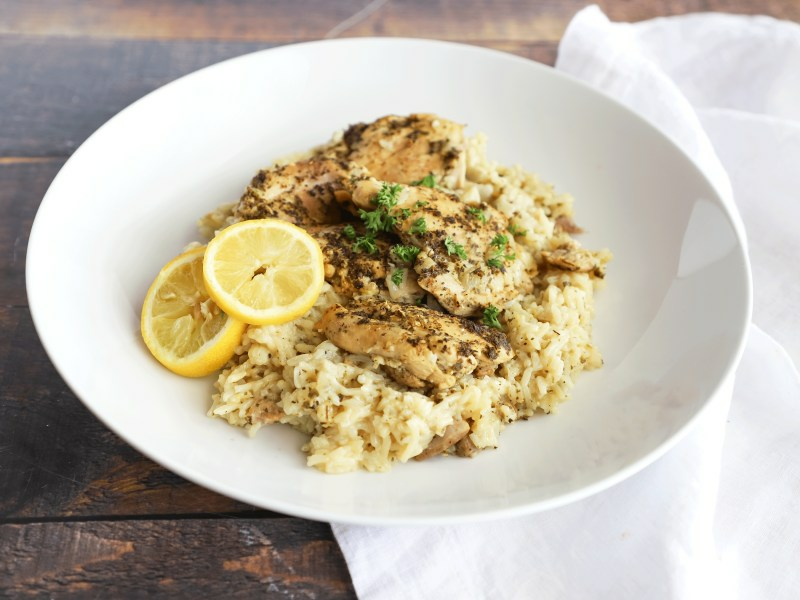 The lemony rice and lemony chicken may seem like overload but it’s not! I ate lots of this, no regrets. Served it with a side of asparagus. Left the marinade in for half an hour. It was incredibly flavorful. Probably one of my favorite recipes to date. The rice was nice and creamy, but not mushy - just how I like it. I paired it with a light salad. I found this dish and instantly thought this would be amazing using fish. My husband spent the day on the water and came home with a few flounder. We used flounder filets instead of chicken and it was absolutely amazing. I cut down the cooking time to about 3-4 mins for the fish and it was super juicy. This was so good! Easy to make and delicious too. I’ll be making this again! Absolutely LOVE this dish! I marinated the chicken though for about 3 hours. (I also fork my chicken so the marinade really gets in there) this is a VERY strong lemon flavor though because of all the marination time but I love it. If you are not a fan of strong lemon you might not like this or maybe just decrease the amount in the marinade/what you put in the pot for the rice. I followed this exact using an instant pot. I was never able to get to pressure, as my IP kept beeping with “burn” warnings displayed. I would stop, stir, and start over per mfr notes, I also added more broth. I ended up using the “rice” button after multiple failed attempts. Everything was cooked through, but not pretty. The burnt rice on the bottom is the worst I’ve ever experienced. Overall the flavor was good and we still ate it but it took longer than described tome and was a mess. I would not make this recipe using these instructions again. Could not get the pressure to build in the pot it kept saying “burn”. No matter how many times I stirred, added some broth, and put it back on pressure cooking it would still display “burn”. Not sure why this recipe did not turn out right but the rice was burnt on the bottom of the instant pot. I had to take the meal out of the pressure cooker and bake it in the oven. Not sure what the trick to a successful Lemon chicken meal would be in the instant pot. Really 4.5 stars. Cooked this tonight and it’s really good but REALLY lemony. It was great with a side of asparagus. Might be better for everyday with a little less intense lemon flavor, like maybe only zest 1 lemon. So far, this is the top recipe I’ve tried from Mealthy! Highly recommend— quick, easy and delicious!